Heard of halo therapy before? 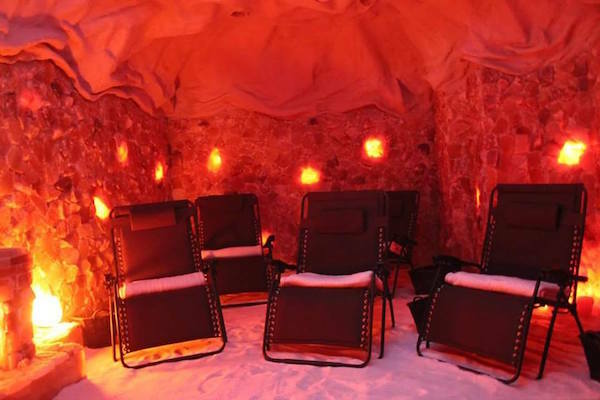 If not, meet the latest wellness trend that that involves sitting in a salt cave. We experienced it firsthand at Be Happy Yoga and Salt Cave in Bowling Green, Kentucky, and it’s 100% life changing. In a nutshell, it involves lounging in a cave made of six tons of Himalayan Salt for up to an hour. If you’re tired and restless, consider it the best adult nap you’ll ever take [insert drool marks here]. And yes, it’s the best stress relieving therapy ever. After wiping the drool off our faces, we decided to ask founder Susan Polk all about halo therapy. As it turns out, there are many more awesome benefits — and all you have to do is chill out and let your mind wander. What exactly is halo therapy? Halo therapy is derived from the Greek word “halos,” meaning “salt,” and is a form of complementary care which makes use of salt. Numerous forms have been known and used for hundreds of years, mostly in Europe where it is still practiced today — and even prescribed by doctors and recognized by insurance companies due to its health benefits! It is quickly gaining interest in the U.S. as man-made salt caves like ours are sprouting up around the country. Why is it halo therapy all the rage right now? With the world busier and people more stressed out than ever, I think halo therapy is quickly growing as a form of complementary care because people enjoy the calming and relaxing environment. How does it help to de-stress and clear your mind? We move at such a quick pace each day, often juggling work and family responsibilities while constantly glued to our cell phones. The environment in the salt cave provides a calm unlike any we are used to encountering in our busy lives. The minute you walk in the room, calming music greets you along with warm, soothing lighting surrounded by thousands of pounds of Himalayan Salt rocks and ultra fresh air diffused with even more salt. All of these components help slow our frantic minds and relax our stressed out bodies. We recommend this for anyone and everyone. In addition to people who have trouble resting and relaxing, halo therapy also provides a lot of benefits for those with respiratory troubles or skin issues. It is a wonderful place to separate oneself from worries, trials, or to have a place and time to meditate, contemplate, or pray. Any other mind or skin benefits? There are numerous benefits ranging from alleviating migraine headaches to even European doctors prescribing salt cave sessions to cancer patients to help build their immune systems up. The ultra fresh air helps those with sinus or breathing issues as well. While it may not be a cure for respiratory issues, we have heard from many that it often helps alleviate their symptoms. It is a great place for anyone to come to de-stress, breathe easier, and live healthier. How often should you go into a salt cave to reap the benefits? 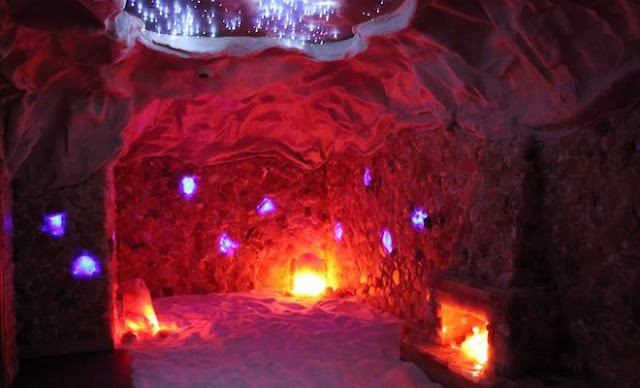 Some people visit our salt cave daily, others weekly or a few times a month, and it really depends on the person.